University of Nevada, Reno students and alum know their college is a top-tier, land grant university with a vibrant campus full of historic beauty. Prospective students? Not so much. When they think Reno, they think bumbling cops from “Reno 911,” strip clubs and run-down casinos in an arid desert setting. 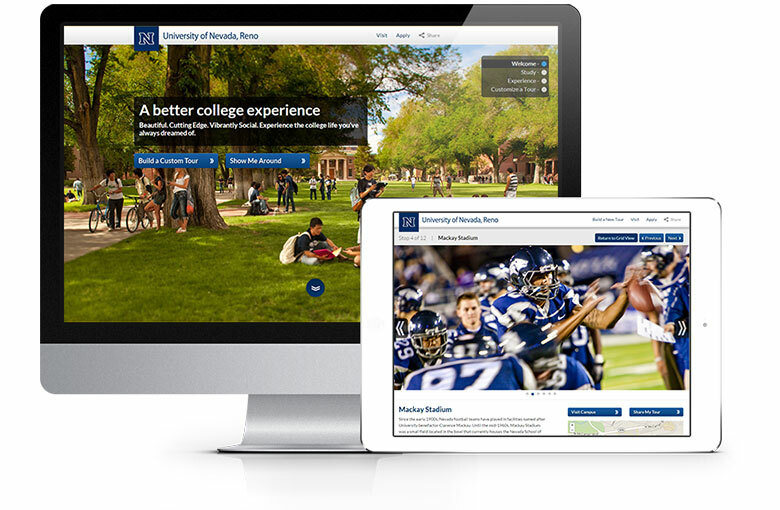 The university needed a clean slate along with a virtual sales tool that would get students to visit campus. They knew visits translate to applications. We held planning and brainstorming sessions away from the computer in detailed meetings. We then discussed and solidified goals for the virtual tour. Noble explored layout and functionality to ensure we captured all of the goals for the virtual tour in an easy-to-use format. 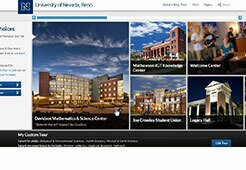 Finally, the immersive experience was brought to life by applying UNR’s branding and photography to the layouts. We put ourselves in the shoes of regionally competitive students who value quality of life as much as a quality education. What would they want to know? What would they want to see? After research and contemplation, we came up with an interactive campus tour with customizable components so prospective students could visualize their dreams by selecting their area of study and the features of campus life which mean the most to them. Given the priority of showcasing the University as a beautiful, yet modern location, we featured well-executed photography of the campus and student life prominently throughout the tour. To get started, prospective students can select “show me around” or “build a custom tour.” To build their own tour, they are presented with a set of questions about their social and academic interests. They then are invited to start their tour and visualize what their UNR experience might look like. Users are able to edit and update their choices at any point during the tour. Keeping the focus on content and encouraging users to sign up for a walking tour ensures a directed goal for the site. 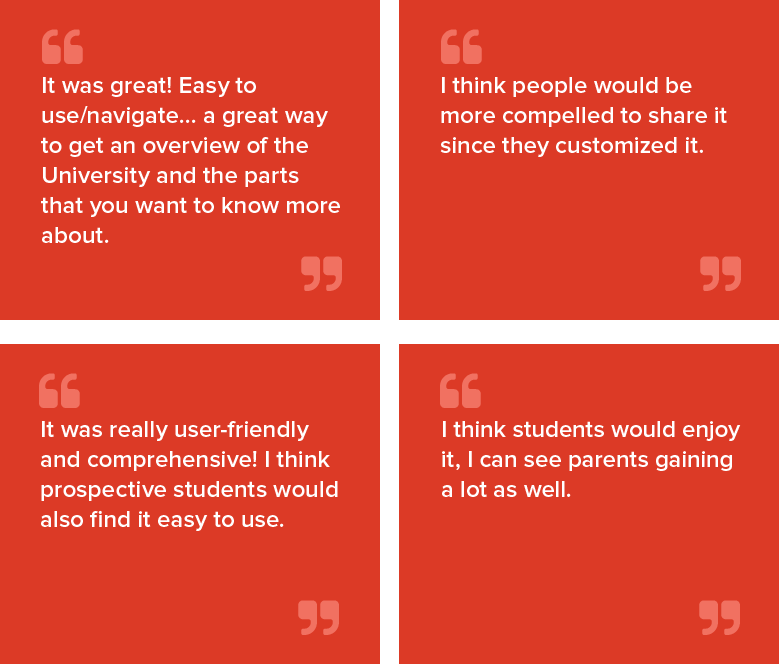 To promote ongoing awareness of the interactive campus tour, students are encouraged to share their experience with friends across their social networks. 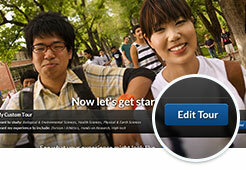 Prospective students may share their customized tour with their friends and parents via social channels. Students are treated to a unique virtual tour experience, customized to fit interests specific to them. UNR can add as additional stops in the future with ease without additional development effort. Prior to launch, real students and on-campus tour guides were given the opportunity to build their own tour. Here is what they had to say. A year after the virtual tour launch, visitors who built a customized tour spent an average of 13 minutes on the site. This is more than nine minutes longer than users who did not view the tour spent on the site. Time on site increased by 83 percent over the previous year. The average number of page views were 16.5, an increase of 11 pages. Roughly 80 percent of the virtual tour participants were from out of state, allowing the university to capture the interest of potential students who were unable to view the campus in person.